In this episode, Host Nick Page inquires about an approach to photography that has become increasingly rare since the rise of digital imaging and social media: releasing new photographs infrequently. 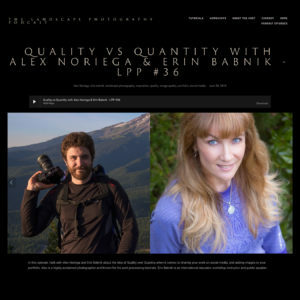 Nick chose Erin Babnik and fellow photographer Alex Noriega as exemplars of this unusual approach because they both make it work to support full-time careers in landscape photography. They discussed a variety of concerns, including online ‘visibility’, the creative process, portfolio curation, and much more.